Beelieve You Can! : Oh NO! Jim and I are both going through health issues. I have been living with chronic pain/illness for over 25 years, with the past 10 years mostly home-bound and needing assistance in my daily life. Now Jim is going through some serious health issues as well. So what do you do when your main care-giver needs assistance as well? In all seriousness, I believe in the Sovereignty of God. That all things are under God's rule and control, and nothing happens without His permission. God works not just some things but all things according to the guidance of His own will (Eph. 1:11). God’s purposes are all-inclusive and never thwarted (Isa. 46:11). There is nothing that takes Him by surprise. The sovereignty of God is not only that God has the power and right to rule all things, but that He does so, continually and without exception. A.W. Pink said it beautifully in The Sovereignty of God, Chapter 1. "What do we mean by [the sovereignty of God]? We mean the supremacy of God, the kingship of God, the god-hood of God. To say that God is Sovereign is to declare that God is God. To say that God is Sovereign is to declare that He is the Most High, doing according to His will in the army of Heaven, and among the inhabitants of the earth, so that none can stay His hand or say unto Him what doest Thou? (Dan. 4:35). To say that God is Sovereign is to declare that He is the Almighty, the Possessor of all power in Heaven and earth, so that none can defeat His counsels, thwart His purpose, or resist His will (Psa. 115:3). To say that God is Sovereign is to declare that He is "The Governor among the nations" (Psa. 22:28), setting up kingdoms, overthrowing empires, and determining the course of dynasties as pleaseth Him best. To say that God is Sovereign is to declare that He is the "Only Potentate, the King of kings, and Lord of lords" (1 Tim. 6:15). Such is the God of the Bible." Amen! There's always a bigger picture, and there's always a bigger God working behind it! All we must do is trust in him! I wish the both of you the very best! You have no idea how much this post means to me. I have been under tremendous adversity myself and your post has helped put things in perspective. I live alone and at times that can be very frightening. Knowing that God is in control is not only comforting but sustaining as well. I am so grateful for your words this morning. You have encouraged me so. 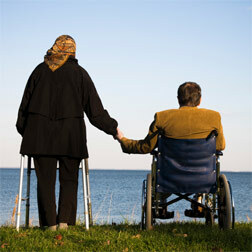 Ii will be keeping you and your husband in prayer, asking God for healing and for continued encouragement.